Your expert in party artistry! 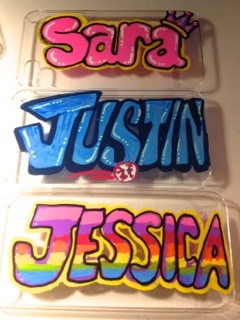 Custom iPhone cases are an amazing party favor! 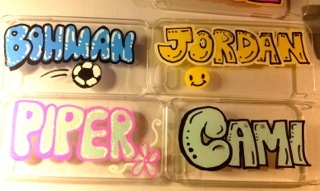 Prices include iPhone 4 & 5 cases! Approximately 12 cases per hour per artist. Contact Cat to book your next party or event! Call 818.426.4855 or email Cat AT cattertainment.com. ... and your fun, sweet personality makes a party even more special. That's a big part of why we chose you. My hibiscus tattoo still looks great! Thanks for helping to make it so much fun for kids and grownups alike!" Best, Patty P.
"Just wanted to let you know that your work is awesome!!!!! The difference between your work and others is huge in your favor. YOU are an artist." Sincerely, Sheila H.
... Olivia was so happy and excited to have you there. We will use you again. YOU did an awesome job!!!!" Laura G.
"Cat, just wanted to thank you for coming out this weekend and to tell you that you were a hit. Kids and the adults loved your work. Can't wait for next year! Have a great one :) " Martha R.